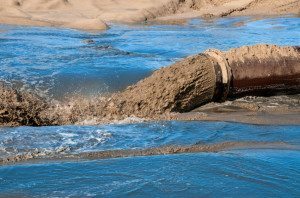 In the stormwater world, there are few things clients and regulators find as vexing as turbidity. Turbidity is simply the suspension of solid particles, (and sometimes gases or liquid colloidal materials) that deflect light while suspended in a water phase, creating a cloudy or murky appearance. These suspended phases can carry pollutants into the receiving water bodies. The main reason turbidity is so troublesome is that it’s so damned obvious. No one likes to see a muddy stream entering an otherwise clear-running tributary. In most cases, particles are heavier than water – but won’t precipitate because they each have a similar electrical charge. These charges act like the same poles of a magnet and repel each other – thereby preventing the solids from settling. Sometimes particles are just not dense enough to sink and too dense to float. And worst of all – sometimes the behaviors change with changing site conditions. There are a few strategies to consider – but first it’s best to know what you’ve got. Once again, getting a basic particle-size-distribution analysis comes to the rescue to help understand treatment options. (Contact us if you need a referral to a laboratory.) Big particles are easier to filter. Particles below 50 microns (0.00005 meter) are difficult to filter. Particles between 25 and 50 micron can usually only filtered by sand or other media with a back-flush function. Flocculants can overcome some of the electrical charge by attracting different particles together to form macroscopic particles that are large enough to settle by themselves. There are thousands of different types of flocculants and their cousins, coagulants. The right combination with adequate residence time will allow for a clear layer to form (supernatant) that can be removed from a sedimentation system as overflow. Large settling basins and sand filters are the most common tools for dealing with difficult turbidity problems. These can be capital intensive or take a great deal of real estate to be effective. Pressurized sand filter systems or gravity based (so-called slow-sand) filters can be used in combination with flocculants and settling basins to achieve a high level of treatment. The coagulant/flocculant materials like chitosan are used to ensure particles are large enough to filter. Electrocoagulation (EC) is an exciting option – albeit potentially complicated. In this type of system, stormwater is exposed to an electric current, which through a combination of electrochemical reactions, disrupts the repulsive forces and allows particles to precipitate rapidly. In some cases, a sacrificial anode provides a chemical reagent for the attraction and co-precipitation of negatively charges (anionic) species. Regardless of mechanism, we’ve had good trial results with EC, with up to 99% reduction in turbidity and in heavy metals. EC has been designed into some of our most challenging industiral and stormwater treatment systems. Each site has a variety factors that should be considered in managing turbidity. As always, prevention is usually least costly. The closer a solution is to the source of the problem, the lower the overall cost. If possible, preventing conditions which create turbidity in effluent is usually the best strategy.